The Paphinia Sea View Apartments are the ideal Mediterranean hospitality choice when enjoying a memorable Paphos holiday. 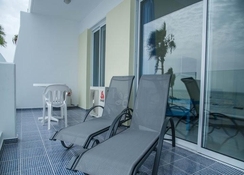 Your stay at Paphinia Sea View Apartments will see you stay in a comfortable and fully-furnished studio or apartment, many of which add a private balcony overlooking the sparkling sea. 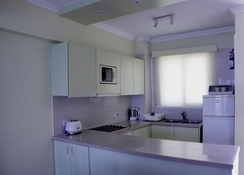 With its well-equipped kitchenette, Paphinia Sea View Apartments is ideal for guests looking for a self-catering holiday in Cyprus. 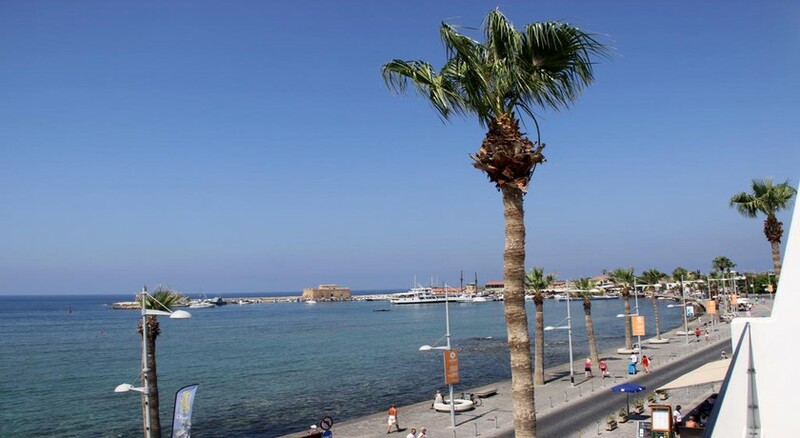 Coupled with its excellent location just moments from the beautiful coastline, Paphinia Sea View Apartments is also just a short distance from many of Paphos’ premier tourist attractions, including Paphos Harbour, Saranda Kolones Castle and Kings Avenue Mall, plus restaurants and bars. 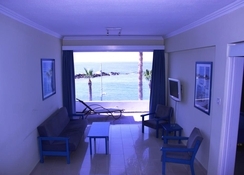 The Paphinia Sea View Apartments can be reached in under 30 minutes from Paphos International Airport. Alykes Beach is a short walk away as are a myriad of restaurants, pubs and great shopping stop-offs. The hotel is also close to the harbour. Rooms at the Paphinia Sea View Apartments all make for a luxurious holiday escape. The Superior deluxe apartments look at over the Mediterranean Sea and Paphos Harbour, while all studios and apartments come with private glass-fronted balconies, air-conditioning during the summer months, cooling granite flooring and a kitchenette as well as all the amenities you would expect to make your stay a memorable one, including microwave ovens, washing machines, fridge/freezer, electric cooker, iron and ironing board, electric kettle, toaster and TV with satellite channels. There are also open plan bedrooms capable of sleeping up to six guests. There are a wonderful range of high quality restaurants all within an easy walk and catering to a variety of global tastes. You can experience fine seafood at the Pelican Restaurant, it's relaxed atmosphere and shade make for a lovely cool location to relax and dine in. For an aromatic curry, head to Jayanta Restaurant, where an array of delicious Indian meals are served. If you’re missing Great British favourites then pop down to The Britannia where you can pick yourself up a classic Sunday roast, traditional English Fish and Chips or Full English breakfast. 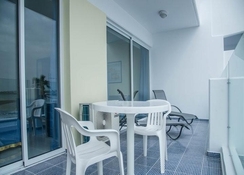 Paphinia Sea View Apartments benefits from a perfect location close to Paphos Harbour, putting you in the heart of the array of entertainment and activities this pretty Mediterranean city has to offer. Beyond the easy access to Alykes Beach and all of its activities, guests can visit three nearby golf courses and embark on a diving experience. There are so many cultural highlights around Paphos, you won't be able to fit them all in on one.